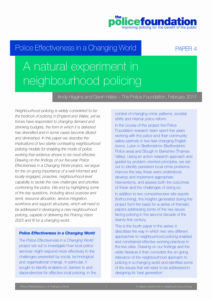 Andy Higgins and Gavin Hales of the Police Effectiveness in a Changing World project team look at the importance of neighbourhood policing in a changing world, focusing in particular on our experience of working in two very different police forces. Neighbourhood policing is widely considered to be the bedrock of policing in England and Wales, yet as forces have responded to changing demand and shrinking budgets, the form in which it is delivered has diversified and in some cases become diluted and diminished. In this paper we describe the impact of two starkly contrasting neighbourhood policing models on police effectiveness. Drawing on the findings of our five-year Police Effectiveness in a Changing World project, we argue for the on-going importance of a well informed and locally engaged, proactive, neighbourhood-level capability to tackle the new challenges and priorities confronting the police. We end by highlighting some of the key questions, including about purpose and remit, resource allocation, service integration, workforce and support structures. All these challenges will need to be addressed in developing a new neighbourhood policing, capable of delivering the Policing Vision 2025 and fit for a changing world. Between 2011 and 2015, our research team worked closely with the police and their community safety partners in Luton and Slough – two English towns that had experienced the local impact of global change particularly acutely. Using action research we took a problem-oriented approach by identifying local crime problems, improving the way they were understood and developing interventions to tackle them. Then we assessed the outcomes of these and challenges of implementing them. Throughout the project we drew on the wider evidence-base on police effectiveness to promote local partnerships, to better deal with the ‘changing world’ and to find sustainable solutions to local crime problems. Most importantly we sought to learn lessons from the process of working with forces on the ground.